Prior to the implementation of FERC Order 714 (April 2010), interstate gas tariffs had been filed electronically for years. In those days, tariffs were broken into tariff sheets, which had very specific requirements for the information displayed in their headers and footers. One specific header requirement was that when a tariff sheet was filed to replace an earlier version of the same sheet, the header must read as highlighted in the example below. The Tariff Filing & Management System (commonly known as TFMS), a software product which was widely used throughout the gas industry, supported this header requirement by providing an association between a tariff sheet being filed and the sheet it superseded. In the example above, Fourth Revised Sheet No. 12 would have been associated (or linked) with Third Revised Sheet No. 12. Via this association, TFMS was able to automatically create a document header like the one shown above. In this same time frame, it was necessary to submit marked (or redlined) documents to FERC that indicated the tariff changes that were being proposed. This requirement was not unlike the “Marked Tariff Changes” rule in Order 714. TFMS provided an association between a tariff sheet being filed and a previously filed tariff sheet in order to indicate the “basis” for the redlined changes. 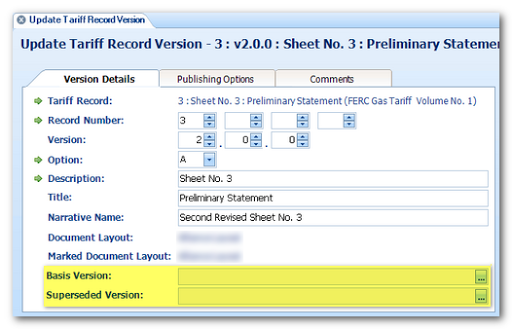 Via this association, TFMS would automatically create a redlined tariff sheet header like the one shown below. Highlighted in the header is the associated “basis” tariff sheet. When TariffShark was being designed, we worked closely with our gas industry customers. Roughly half of them expressed a desire to continue working with sheets under eTariff. Primarily, their thinking was that it would be less disruptive to both their internal business processes and their customers than it would be to change over to a section-based tariff approach. Therefore, TariffShark was built with features that parallel TFMS’s sheet associations described above. Specifically, Tariff Record Versions (TRVs) can be associated with other TRVs in two different ways. First, a TRV’s “Superseded Version” field can be used to indicate which TRV is superseded. Second, a TRV’s “Basis Version” field can be used to indicate which TRV forms the basis for its marked content. These fields appear on both the “Create Tariff Record Version” and “Update Tariff Record Version” forms within TariffShark. The image below highlights these fields on the Update Tariff Record Version form. These fields are provided for backward compatibility with TFMS and with the old way of managing and filing sheet-based tariffs. You would use these fields if you have configured TariffShark headers to include the sheet-style “Superseding” clause. You might use these fields for your own internal recordkeeping purposes. These fields are not required by FERC. The data populated in these fields is not sent to FERC in the XML file. If you have questions, please post them in the comments below or contact TariffShark Support.